The disk radiates a scalar field about 10-foot radius in all directions. Place near any living organism(s) for benefits, see specific applications below. 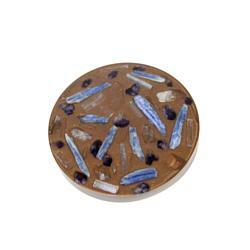 Fresh And Alive Ormusite Scalar Energy Disk, 10-inch has been added successfully to your wishlist. 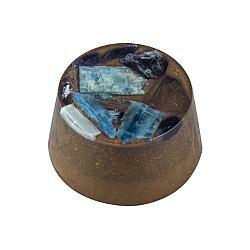 For those familiar with orgonite, ormusite is similar but not the same thing. There are a wide variety of materials on the internet labeled as orgonite made by lay people, most of whom have no understanding of the physics involved in how properly constructed orgonite works, nor an understanding of scalar fields, how they work, how to create them, or measure their effects. Most of the orgonite products available online are made by people copying the work of Don Croft, and Karl Hans Welz, the inventor of orgonite. Croft created a material made of simple, easy-to-find ingredients that mimicked Welz's orgonite, and it can create scalar fields but is much bulkier than Karl Welz's creation. Most of the orgonite products found online are poor variations of Croft's work. Ken Rohla has tested orgonite from many of the major vendors online and most is weak at best. Welz's orgonite is properly constructed and works well, but it is fairly expensive, and it does not include ORMUS technology. ORMUS or ORME minerals are superconducting elements, mostly the platinum group elements on the periodic chart, which can act as a conduit or antenna for very beneficial high frequency scalar energy that flows between other dimensions of time and space. Their discovery has many exciting applications and implications that will change the world. Our ormusite products contain 16 ORMUS-bearing minerals in a proprietary format that is unlike orgonite found elsewhere. Scalar energy is faster-than-light spiraling waves that continually branch in recurring patterns as they flow. Such recursive branching patterns are called fractals. Evidence from scalar physicists like Dr. Thomas E. Bearden, Dr. Konstantin Meyl, Dr. Nikolai Kozyrev, and others indicates that scalar waves "coagulate," or slow down to slower than light (subluminal) speeds and can structure conventional electromagnetic energy and even become physical matter. The term scalar refers to their structure; unlike the usual side-to-side oscillating "transverse" waves such as those on the ocean, they are "longitudinal" more like a compression wave see the video to the right for examples. Scalar energy is often labeled with other names such as prana, chi or qi, zero point energy, tachyon energy, biophotonic energy, Rife energy, kundalini, life force, etc. They are all faster-than-light waves that can slow down and become particles, electromagnetic (EM) waves, and matter, or alter the structure of EM energy. The scalar energy frequencies generated by Fresh And Alive's devices are very beneficial and support health and well-being. Place within 10 feet of a person (the closer the better) to increase energy and reduce fatigue, reduce the effects of electromagnetic radiation, promote a calmer, more relaxed mood, improve sleep, increase muscle strength and balance. Place the disk between your mattress and box spring for improved sleep. Place next to body or under a pillow to help relieve pain and headaches, reduce stress, improve results when engaged in body work such as massage, etc. Massage therapists can place the disk next to or on the underside of a massage table to improve results of massage and energy work on the chakras and spine, reduce pain, and increase range of motion, flexibility, and balance. Some clients report less pain and stiffness during and after deep tissue massage or similar body work. For athletes, physically active professions, or sleep issues, see our Rest Shield powered scalar energy device for much greater results. The scalar fields produced by our ormusite devices improve fermentation of Effective Microorganisms (EM) or similar probiotic cultures, kombucha, kefirs, yogurts, beer, wine, and other ferments. The scalar field of the disk can eliminate mold and contamination of ferments when placed under the fermentation vessel. Our scalar energy disks are a better solution than Holy Hand Grenades (HHGs) for fermenting; we recommend placing the 6.5-inch disk underneath 2 gallon or smaller vessels and our 10-inch disk underneath larger fermentation vessels up to 8 gallons. But you may use several HHGs to improve yields and nutrient levels of any fermented food, beverage, or homemade supplement. For a 2-gallon vessel, place one or two HHGs near the top and one or two HHGs near the bottom. For a 5-gallon vessel, use 2 or more HHGs at each end. See our free gifts page at http://gifts.freshandalive.com (username: guest, password: fresh) for instructions on how to brew your own inexpensive probiotic supplement. The 10-inch scalar energy disk can be used to help reduce the effects of electromagnetic (EM) radiation, but it's large size is unwieldy for most portable applications. You may place it under your bed mattress to improve sleep and protect against electromagnetic fields (EMF). 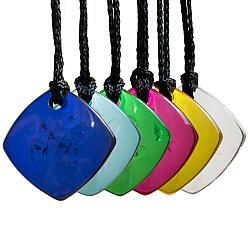 See our 6.5-inch disk, Holy Hand Grenades and other products for EMF protection. Place under or near water vessel (pitcher, water crock, etc.) to improve taste, hydration, and homeopathic effects (molecule clustering and structure) of water. Place under or near container(s) of food during storage to reduce spoilage. Place under or near food during preparation and/or before serving to improve flavor. Place within 10 feet of plants to improve health, reduce stress, improve growth, and reduce mold. For green houses, sprouting rooms, and larger areas, see our Rest Shield for a much stronger scalar field that has more effects and reaches a 20-foot radius in all directions. Place under or near a pet bed or sleeping area to improve sleep, increase energy and reduce fatigue, accelerate healing, reduce the effects of electromagnetic radiation, promote a calmer, more relaxed mood, increase muscle strength, balance, and performance. For competition animals such as race horses and show animals, see our Rest Shield powered scalar energy device for much greater results. For insects, see our 6.5-inch ormusite disk and Holy Hand Grenades for more cost-effective solutions. The scalar energy disk will improve oxygen absorption of water making a healthier environment for fish, but our Holy Hand Grenade scalar devices are a much less expensive way to achieve this. Do not place inside aquarium, the disk resin may offgas and harm fish. Each disk is composed of kyanite, quartz, and amethyst crystals embedded in a proprietary substrate composed of 15 different metals, magnetics, and ORMUS-bearing minerals. ORMUS, ORME, or M-state minerals are minerals that are superconducting under ceratin conditions and can create natural Meissner fields and scalar fields that are highly regenerative to living organisms.